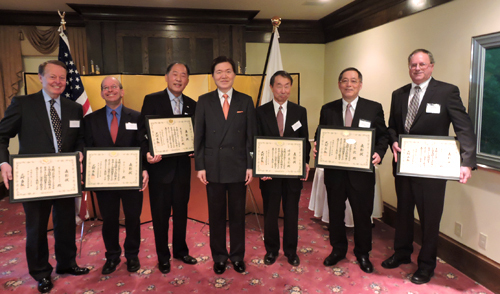 The Consulate General of Japan in Seattle recognized contributions to Japan-US relations Jan. 22. In a ceremony held during the New Year’s Reception at the Official Residence recipients were awarded the Consul General’s Commendation. Dr. Charles Aanenson: CEO of Peace Winds America. In the wake of the Great East Japan Earthquake, Aanenson established a platform facilitating the reconstruction of fishing villages in Tohoku. Nir Barnea: NOAA Marine Debris Program West Coast Coordinator. Barnea organized agencies in the US, Canada, and Japan to respond to Japanese Tsunami Marine Debris. Shinji Kokage: Senior Advisor to the Japan Business Association of Seattle. Yoshiaki Minegishi: Lifetime Director of the Seattle Symphony. Tom Sasaki: Former President of Japanese Community Service of Seattle. He also served as Chair of the Japan-America Society, a board member of the Japanese Community and Cultural Center of Washington, and President of JCSS.